These technologies have become central to all kinds of development, beyond just building websites. If you're building web applications, designing for mobile devices, or working with the web's evolving infrastructure, you need to keep up with the proliferation of new technology that's driving the web forward in all the forms it takes. At Fluent, you'll immerse yourself in learning and engage with the wider web community. Fluent's speakers are people who are working with—and sometimes building—the same technologies you use. Fluent offers a variety of forums for learning, from immersive tutorials and sessions with experts to the "hallway track" between sessions where attendees informally connect and share questions, knowledge, and perspectives with their peers. If you're working on the modern web—whether you're independent or part of a large team—and you want to gain hands-on learning, make meaningful connections, and share ideas across communities, then Fluent is the place for you. If you want to grow more fluent in speaking the language of the global, expanding, maturing web, we invite you to join us at Fluent! Fluent is a place to find your tribe and to connect with other communities and people you've always wanted to meet. Whether you're a regular at conferences and your local meetup or you're completely new to the conference scene, Fluent provides different opportunities for you to interact with people in the wider web community. 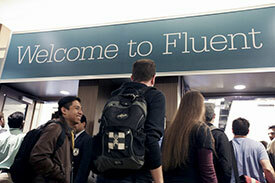 Fluent is one of the best informational and networking events in technology. 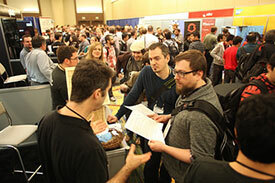 From the keynote presentations to the after-hours meet and greets, every event was well thought out and executed. I will be back next year." Awesome experience at Fluent, learnt so much thanks to all the great speakers. Now to find all the pieces of my exploded brain!" We couldn’t be happier with the results." Fluent is the best place to see the current state of the web and where it is headed in the future." Fluent was one of the best parts of the year. The information you will take away from this conference will set you up for the whole year and beyond. I will take away so much from this event and excited to implement all the neat ideas in my workplace!" 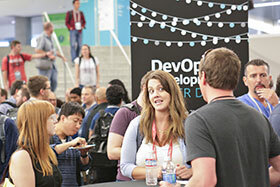 Great to see women developers rocking at #fluentconf. @LeaVerou preso on RegEx was awesome. I really needed that." I loved the networking that I got while I was there. I have never had a chance to rub shoulders with so many of the leading JS engineers. Fluent conference solidified itself in my mind as a great center for modern web development and disruption." The conference was a difference maker / eye-opener for me. The richness of the community is something that cannot be comprehended from a remote location. Working and talking with the folks who know today and are our visionaries makes me very excited to be a part of the community." Tammy Everts is chief experience officer at SpeedCurve, where she helps companies understand how visitors use their websites. She has spent the past two decades studying how people use the web. Since 2009, she’s focused on the intersection between web performance, user experience, and business metrics. Tammy's book, Time Is Money: The Business Value of Web Performance (O’Reilly, 2016), is a distillation of much of this research (but there’s always more to be learned). She cocurates (with Tim Kadlec) WPO Stats, a collection of performance case studies.